Electronic skin lets any prosthesis feel touch and pain « Adafruit Industries – Makers, hackers, artists, designers and engineers! Researchers have developed an “e-dermis” or electronic skin that could be applied to a prosthetic hand to give the wearer a sense of touch. By using electronic sensors that mimic the nerve endings in the body, the skin can convey both the senses of touch and of pain. The skin is made of a combination of fabric and rubber, into which the electronic sensors are embedded. The technology isn’t invasive, but relays sensation through the wearer’s skin using a method known as TENS, or transcutaneous electrical nerve stimulation – a process that needs hours of mapping of the subject’s nerve endings. 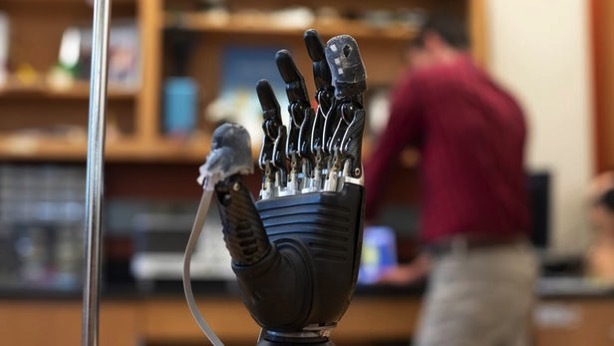 It’s thought the technology could make sense of so-called phantom limb sensations in amputees – the name given to the feeling that a missing limb remains present. The researchers used EEGs to confirm that phantom-limb sensations were felt during stimulation via the electronic skin over the course of tens of hours of testing.